Penticton and District Community Resource Services has a large mandate in the South Okanagan. They cover a wide array of public services from Summerland to Osoyoos. This includes childcare services, counselling services, senior care services, community resources for people in need, transportation services, employment services through their nonprofit business Paper Shuffle and much more. Before launching the new website, there were 5 separate websites to accommodate all of their different services. Needless to say, it was a difficult task to manage. The challenge was to create an online experience where the site visitor could easily find what they were looking for in a dedicated area. We needed to eliminate a lot of content that was repeated across all five sites and consolidate the information into a well thought out information architecture. 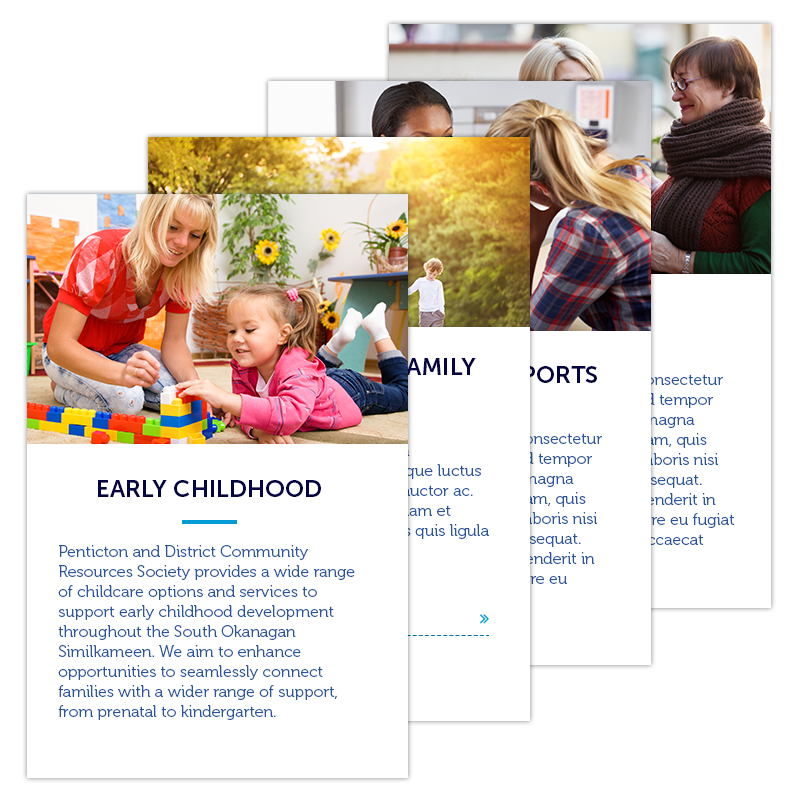 With the new information architecture, the core services that PDCRS offer was regrouped into four core sections based on the type of user coming to the site. The next challenge was to show the different services offered in the different communities throughout the region. PDCRS does not just service Penticton but for Osoyoos, Oliver, Okanagan Falls, Hedley, Keremeos, Cawston and Summerland areas as well. A way to promote these communities was also a priority. Two final requirements where needed. The first was to implement a new directory that featured a map function for the community. There were also several dedicated micro sites for services like Paper Shuffle, the childcare services, Handydart and counselling services. There was a lot to consider while putting together this solution for PDCRS. Trying to make a complex community site with a diverse user based was a real challenge. The success of the site is in the reorganization of the content based on the user personas that we discovered. Spincaster compiled and reviewed all of the existing site content and rebuilt the new solution based on the five sections. This structure was reviewed with the many stakeholders involved and fits the requirements nicely. 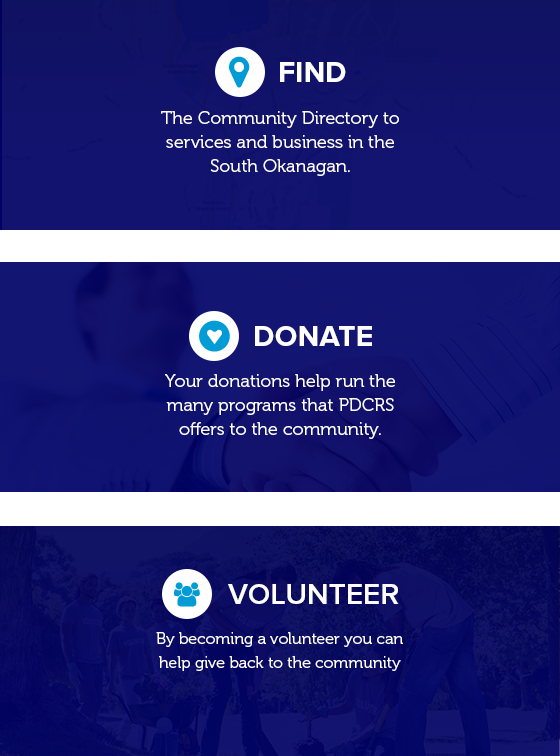 Organization information – Providing a place for people to donate, volunteer, and learn more about PDCRS. Connections and site links in each section help to knit the PDCRS family of services together nicely. The new site is a complex solution that is well organized and provides clear paths for each user type to take. From the home page, we integrated calls to action that provide quick navigation tools to key sections of the site. Once a user is in a particular section it is easy to move around and find relevant information. 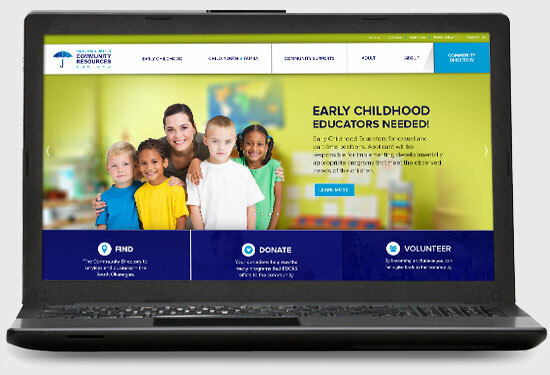 Landing pages for big ticket items like PDCRS Childcare allow us to share information and control the flow of information to the visitor. The experience is quick and easy and follows a three-step process for most tasks. With this upgraded custom solution built on WordPress, it allows their administrative team to do quick and easy updates. The custom directory tool uses a modified WP plugin to create a powerful search for community services that is mobile friendly and provided much-needed map information. The careful attention to the creative design ensures that the site is friendly for seniors while still providing a nice modern feel. With so many users and the different types of users, the new PDCRS unifies them all into a single community hub. It was a real pleasure working with the PDCRS team and we wish them the best of luck in 2017 – their 50th anniversary.